is held at the Hartford Civic Center in Connecticut at 10:00 a.m.
Chicago, Illinois. The film, featuring eight animated segments synchronized to pieces of classical music, first premiered last November 1940 in New York City. A total of thirteen roadshow versions of Fantasia are being held across the United States. Exhibited in the form of a "limited-run roadshow attraction," the theaters are equipped with Fantasound, a pioneering stereophonic surround sound system. The TV series Walt Disney Presents airs "Texas John Slaughter: Apache Friendship,"
Ranger John Slaughter, the serial has been running since 1958. Walt Disney Presents airs part 1 of the 1956 film "Westward Ho, The Wagons!" About the adventures of a group of pioneers as their wagon train crosses the West in 1846, it features Fess Parker, Kathleen Crowley, David Stollery, Sebastian Cabot, George Reeves and Doreen Tracy. An article titled "Florida's Disney World Aims at '70 Opening" by C. E. Wright appears in the Sunday New York Times. condors' flight to sailing sky-high with them, it is narrated by Leslie Nielsen. "Goofy's Radio," "Car Washers" (with Mickey, Donald, and Goofy), and "Pluto's Seal Deal." job and moving to a tropical island paradise. technical literacy, begins at Epcot's Innoventions West on this Presidents' Day. The 40th Academy Awards will take place April 10. Dragon, Saludos Amigos, Make Mine Music, So Dear to My Heart, Cinderella, Peter Pan, and Mary Poppins. In 1965, he won the Academy Award for Best Visual Effects for directing the animated sequence in Mary Poppins. 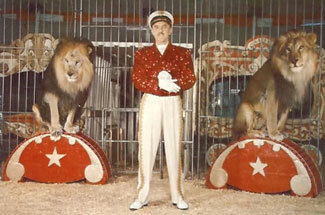 Keller's Jungle Killers, a circus act in the Mickey Mouse Club Circus tent, opens at Disneyland. The act features George Keller, a college professor-turned-lion tamer who has previously performed with the Ringling Brothers Barnum and Bailey Circus! Keller's Jungke Killers include African lions, tigers, leopards, mountain lions, jaguars, black panthers and even a cheetah. Keller will continue his show at Disneyland through September. Originally a popular college professor of visual arts at Bloomsburg Teachers College in Bloomsburg, Pennsylvania, Keller's interest in show business started back in 1939 when he ran a Jungle Farm sideshow in his spare time. Three Caballeros, it was developed from the South America Disney "Good Neighbor" trip. acts, a visit from director Tim Burton, and an appearance by the film's star Johnny Depp. on Tuesday, February 23. The first showing of the 18-minute movie is set for 10 a.m.
part of the Association of Zoos and Aquariums Species Survival Plan. Singer Kelly Clarkson, in the midst of a North American tour, visits Walt Disney World. "Breakaway" was first released by Walt Disney Records as the first single of The Princess Diaries 2 soundtrack. In February 2009 she took part in the grand opening of Disney's American Idol attraction at Disney's Hollywood Studios. The nominations for the 46th Academy Awards are announced. Floyd Huddleston) is nominated for Best Song. Oscar night is April 2. The nominations for the 64th Academy Awards are announced. Oscar night is March 30.